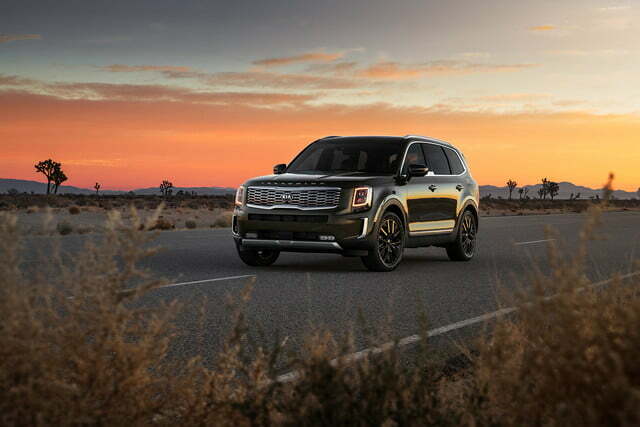 The Kia Telluride skillfully rolls SUV and car traits into a spacious, connected package. Kia (like its corporate sibling, Hyundai) is on a mission to expand its crossover and SUV lineup to better serve a buying public that just can’t get enough of more-than-enough. 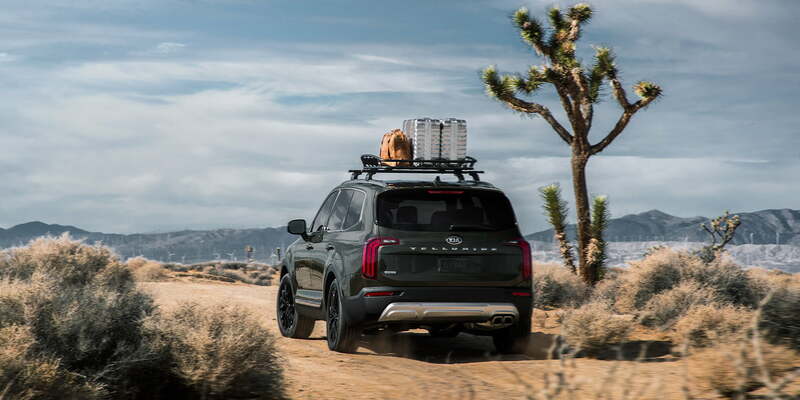 To that end, the new, range-topping 2020 Telluride gives Kia an entry in the hotly-contested large SUV segment. 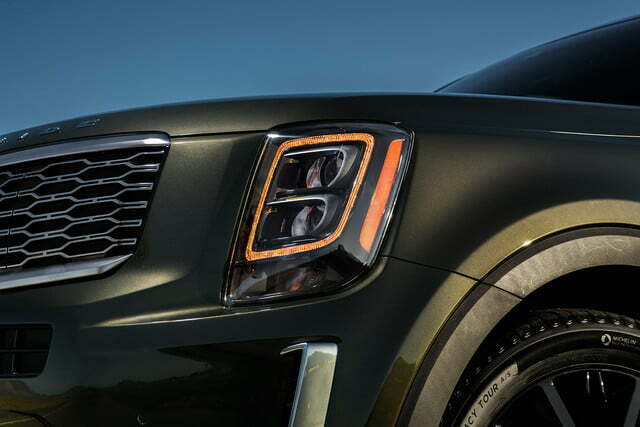 The 2020 Kia Telluride comes in four trim levels (LX, S, EX and SX), all of which are available in either front-wheel drive (FWD) or all-wheel drive (AWD) configurations. The FWD LX model starts at $31,690, and the top-end SX checks in at $41,490. Adding AWD to any model requires spending $2,000. Destination is pegged at $1,045 for all models. Kia baked just about everything into the Telluride’s trim walk, leaving very little room for à la carte configuration. 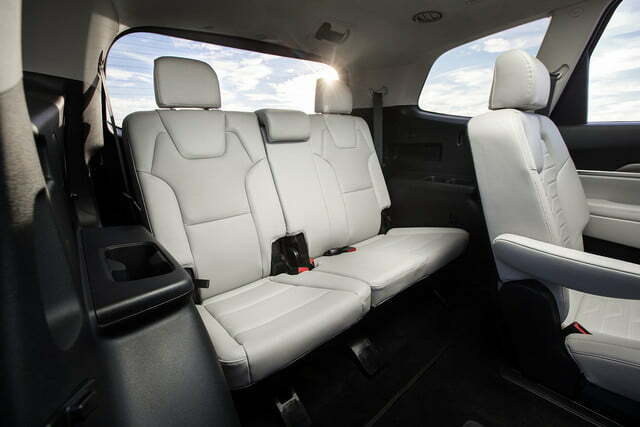 A second-row bench can be substituted for the standard captain’s chairs on S models for $100; a $795 tow package adds a hitch and self-leveling rear suspension; and a $2,000 Prestige Package (exclusive to the SX with all-wheel-drive) bundles Nappa leather upholstery, a head-up display, second-row heated and ventilated seats, rain-sensing wipers, a 100-volt inverter, and a heated steering wheel. Our test vehicle was an SX model with all-wheel-drive and the Prestige package. With carpeted floor and cargo area mats, our Telluride rang the till at $46,860. This is about as loaded as it gets. 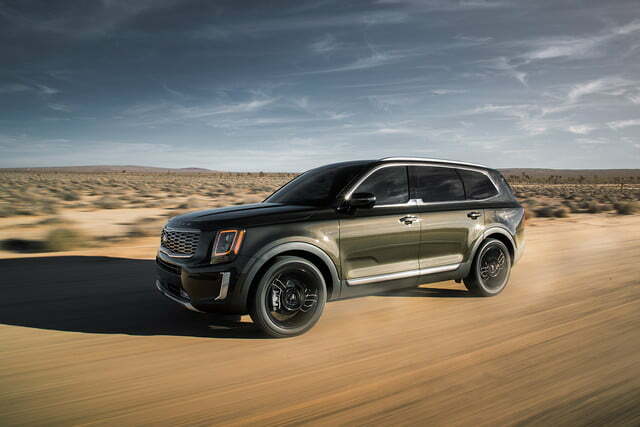 Kia’s mission for the Telluride was twofold. Not only did the company want to add a full-blown midsize family hauler to its lineup, but it put special emphasis on it being an SUV rather than simply a larger Sorento. That last point is important. The Sorento may be advertised as a midsize, three-row crossover, but it’s technically built on a compact crossover platform. 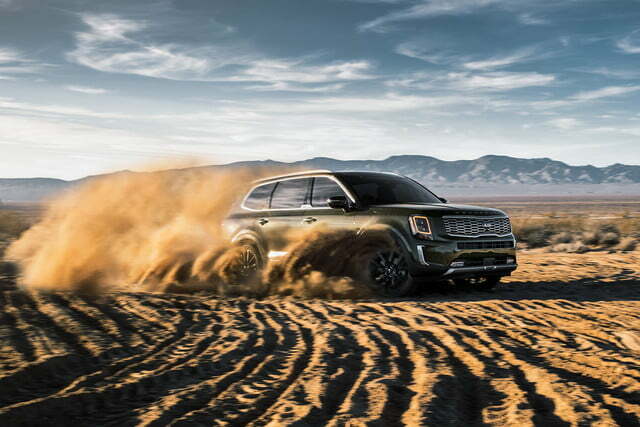 Kia could have simply cut the proverbial sausage to yet another length, but differentiation was a key part of the Telluride’s mission from the get-go. The result pays dividends in more ways than one. 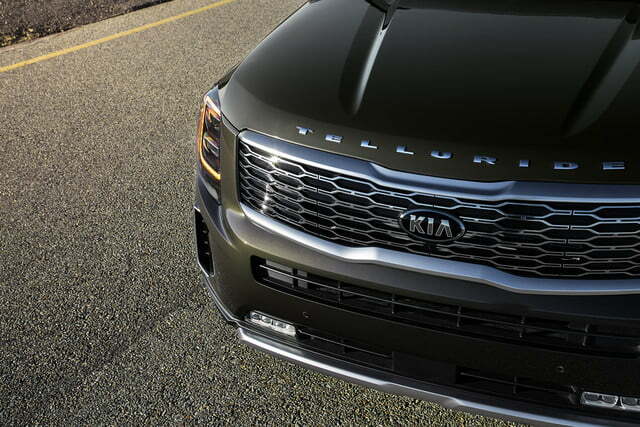 The Telluride doesn’t just look more SUV-like than its competitors. It also offers the practical advantages of a boxier, more upright shape without making significant sacrifices in efficiency. The Telluride offers more space for people and gear than many of its competitors. 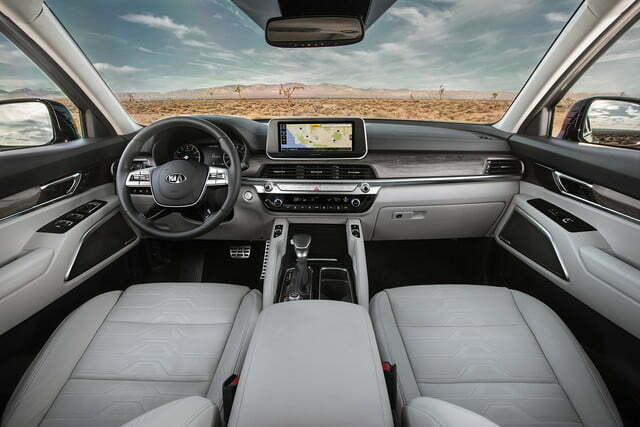 Kia long ago left behind its cheap economy car heritage, so it’s no surprise that the Telluride boasts a cabin befitting its $32,000-and-up price tag. The interior touches in our loaded-up test models were particularly impressive, especially considering that the wood and metal finishes are not what they seem. Kia calls them synthetic, which is an appropriately sophisticated way of saying fake, but they are nonetheless impressive. 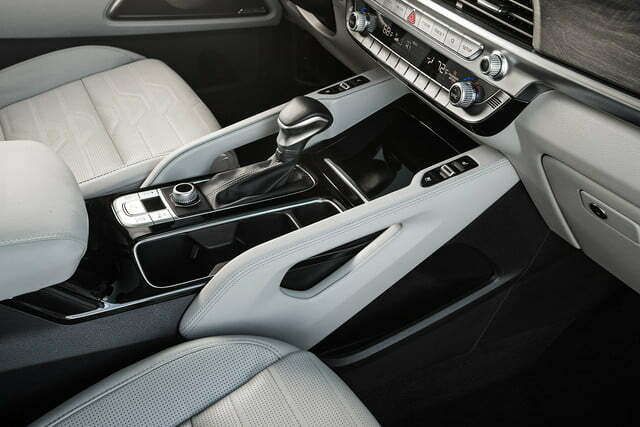 Where some manufacturers may use high-gloss, plasticky woodgrain trim panels, Kia opted instead for an exposed-grain effect. It’s a premium execution reminiscent of the way Volkswagen used to dress up its mainstream models. From a practicality perspective, Telluride offers more interior passenger and cargo volume than just about any of its competitors (including the brand-new Subaru Ascent and Volkswagen Atlas) and, notably, the larger, truck-based Chevrolet Tahoe. It gives occupants 157 cubic feet of space, while the Tahoe only musters 122.4 cubes. Those figures don’t tell the whole story, though. The Telluride has 21 cubic feet of trunk space with a full load of passengers. With the third row stowed, the number increases to 46 cubic feet. Drop both passenger rows and you get a whopping 87 cubes. The Tahoe checks in at 15.3, 51.7, and 94.7, respectively. The Ascent and the Toyota Highlander trail both models with a maximum cargo capacity of 72.6 and 83.7 cubes, respectively. The Atlas comes out on top with up to 96.8 cubic feet of trunk space for your gear. 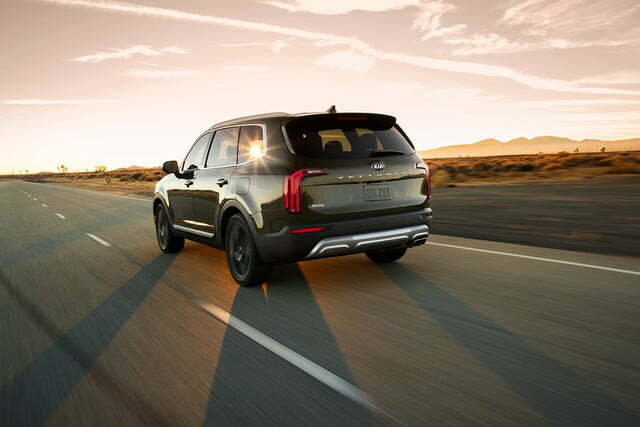 The Telluride offers a robust suite of standard tech and driver assistance features, including a couple (lane follow assist and rear cross-traffic avoidance with braking intervention) which are segment firsts. The rest of its standard features read like the bulk of a spec sheet for level two semi-autonomy: automated emergency braking with pedestrian protection, smart cruise control with stop-and-go, lane-keeping assist (not to be confused with the aforementioned follow function, which actually centers the Telluride in the lane), and blind spot detection with collision avoidance and braking/steering intervention. Upgrading to the EX or SX trim gets you Kia’s Highway Drive Assist technology, which integrates all of the above features into a semi-autonomous driving system which the firm has internally validated as a level two suite. Exclusive to SX models is a neat blind spot view monitor, which uses blind spot cameras to display images on the Telluride’s central screen. This feature is almost identical to Honda’s LaneWatch. Speaking of that screen, the 10.25-inch infotainment system in our test vehicle was intuitive and robust. The large feature-selection buttons (located between the volume and tuning knobs, below the central air vents) lack contrast in direct sunlight, occasionally making it tricky to locate the main functions, but otherwise we had essentially no issues with the system. The EX trim represents the sweet spot for tech-enabled value thanks to the inclusion of wireless device charging and an additional USB charge point. 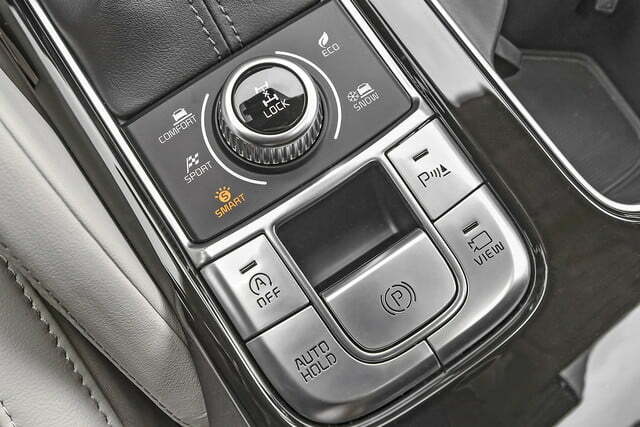 While we’ve had our gripes with Honda’s fickle attitude toward physical controls for its infotainment system, we have to acknowledge that we prefer the Pilot’s touchscreen-based feature selection to Kia’s reliance on widely spaced physical controls. Both systems offer robust features, but Honda’s implementation is a little bit cleaner and more coherent. The standard 8.0-inch screen offers almost all of the same features as the 10.25-inch unit, though it notably (and predictably) lacks navigation. Android Auto and Apple CarPlay integration are both standard from the base model on up. 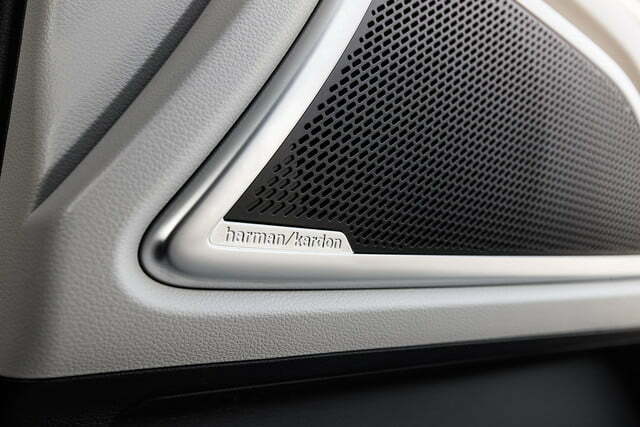 LX through EX models offer a six-speaker audio system connected to the 8.0- or 10.25-inch display, while SX models boast a 10-speaker Harman Kardon system with surround sound, an external amplifier and a dedicated subwoofer. 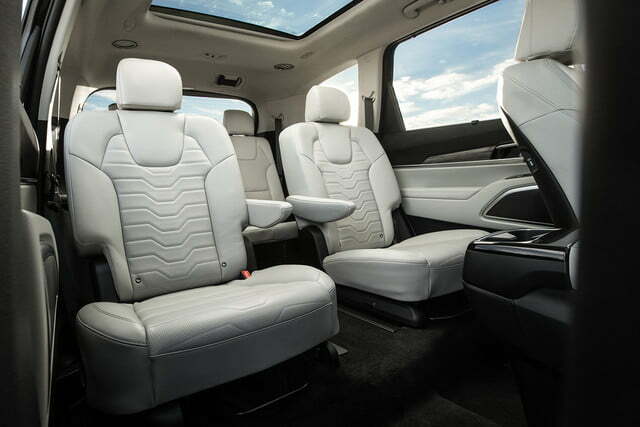 It’s worth noting the Telluride does not offer an integrated rear-seat entertainment system. We’re not sure that’s much of a drawback, as these systems have already been nearly obsoleted by the advances of personal device entertainment. Just a few years ago, they were life-saving must-haves for large family vehicles. In 2019, they’re quickly becoming overpriced afterthoughts. 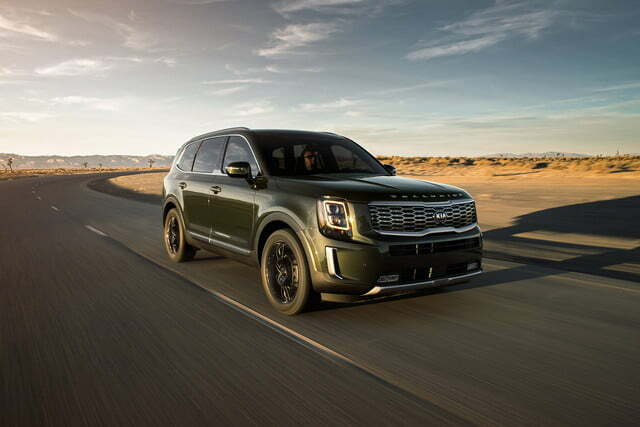 Kia offers the 2020 Telluride with a single engine and transmission combination. Power comes from a 3.8-liter V6 and gets to the wheels by way of an eight-speed automatic transmission. The V6 produces 291 horsepower and 262 pound-feet of torque, which is par for the segment. 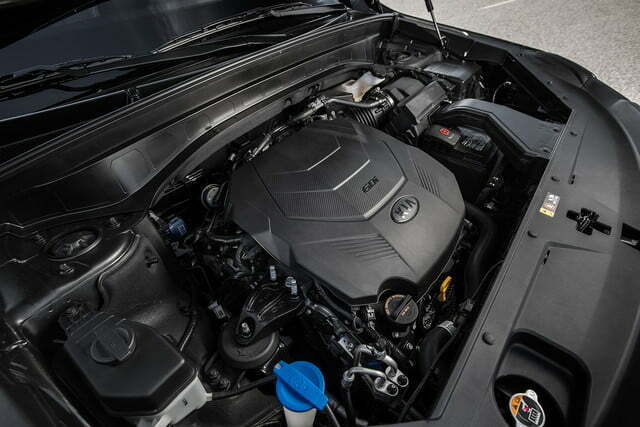 Equipped with the available tow package, Kia’s biggest model can tow a 5,000-pound trailer, which places it also right in the meat of the segment, notwithstanding the oddball Dodge Durango. On the road, the Telluride is a comfortable, hassle-free companion. The steering is dialed-in to the point where there’s no need for constant course corrections. Our 4,400-pound test model never felt excessively large or heavy, offering car-like reflexes despite its size and heft. We were also impressed by the front-row seats, which left us fatigue-free after nearly five hours behind the wheel. It’s not as sure-footed off the beaten path, where even the AWD model struggled on a moderately challenging trail. It may look like a rugged, go-anywhere SUV but don’t mistake it for a Jeep Wrangler. The AWD is comfortable in low-traction environments, but situations which challenge the Telluride’s eight-inch ground clearance and long wheelbase aren’t easily overcome by its street-spec tires and an AWD system intended to trivialize foul weather rather than off-pavement obstacles. There were limited opportunities for us to test out the Telluride’s semi-autonomous features, but we made use of what little time we had. The lane following system proved up to the task of keeping things pointed the right direction even on the questionably maintained roads of rural western Colorado, and the cruise control maintained appropriate distances. It held its own even on some of the tougher grades. Environmental Protection Agency (EPA) figures for the Telluride are typical for the segment. FWD models are rated at 20 mpg in the city, 26 on the highway and 23 combined. Adding AWD drops those ratings to 19 city, 24 highway and 21 combined. It’s worth noting that these figures are not trim-dependent, so wheel choices should only factor into ride quality. If it’s efficiency you’re after, we recommend looking at the hybrid variant of the Toyota Highlander, which returns up to 30 mpg in the city and 28 mpg on the highway. The Telluride is designed to take on the entire midsize SUV and crossover segment, but while the list of models competing in this space is expanding by the day, it’s no surprise that Kia has its sights set squarely on the two Japanese segment heavyweights: The Honda Pilot and Toyota Highlander. Both the Pilot and Highlander are actually a few hundred dollars cheaper than the Telluride base-for-base, which may be surprising considering Kia’s focus on value, but the Telluride’s standard feature content actually makes it comparable to Honda and Toyota trims costing several thousand dollars more. It’s also worth noting that the Highlander does not offer Apple CarPlay or Android Auto integration at any price point, though the former (at minimum) is expected to be rolled out soon. Other options include the Subaru Ascent and the Volkswagen Atlas. The Chevrolet Traverse comes in under the Telluride and its Japanese benchmarks at entry-level pricing, but fully loaded examples option out well above the $50,000 mark – that’s $8,000 more than a Prestige-package Telluride. 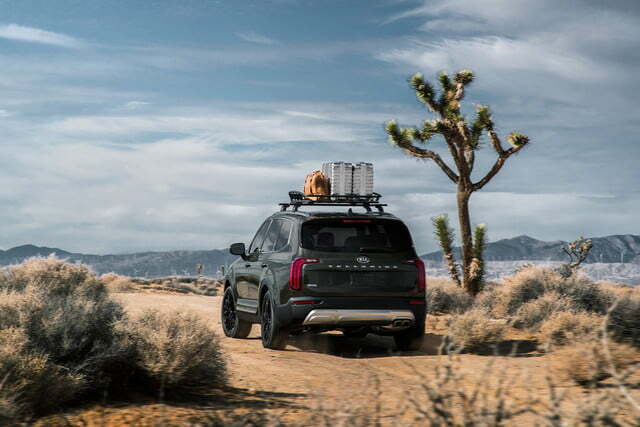 Like all Kia models, the Telluride boasts a class-leading, 10-year, 100,000-mile powertrain warranty alongside a five-year, 60,000-mile basic warranty (with matching roadside assistance). While those terms are comforting, you’re unlikely to need them, as Kia has scored above the industry average in recent reliability rankings. Telluride’s occupant safety credentials are bolstered by the standard driver aids we mentioned above, but there are a couple of standard safety goodies that deserve to be highlighted here. Chief among them is its Safe Exit Assist feature, which uses the blind spot monitoring sensors to restrict rear door opening if a vehicle is approaching when a passenger tries to exit. A rear occupant alert system is also standard. It will notify owners via a smartphone alert (and a toot from the horn) if movement is detected in the rear seat after the vehicle has been shut off and locked. Unlike some rear seat reminder systems currently available from the competition, it won’t help you remember your leftover pizza, but it will alert you to the things that really matter. 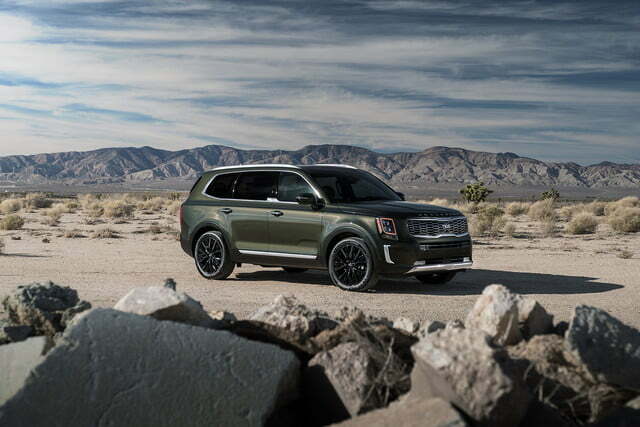 The beauty of the 2020 Kia Telluride is that most of the must-have tech is baked right in to the base model, but for families who prioritize connectivity, the EX model represents the sweet spot for tech-enabled value thanks to the inclusion of wireless device charging and an additional USB charge point. EX is also the first trim to offer the larger, 10.25-inch infotainment screen with Quiet Mode (which silences the rear speakers on demand) and Driver Talk (which amplifies the driver’s voice for second- and third-row passengers). Also included are other convenience features such as a hands-free power liftgate and an auto-dimming rearview mirror. 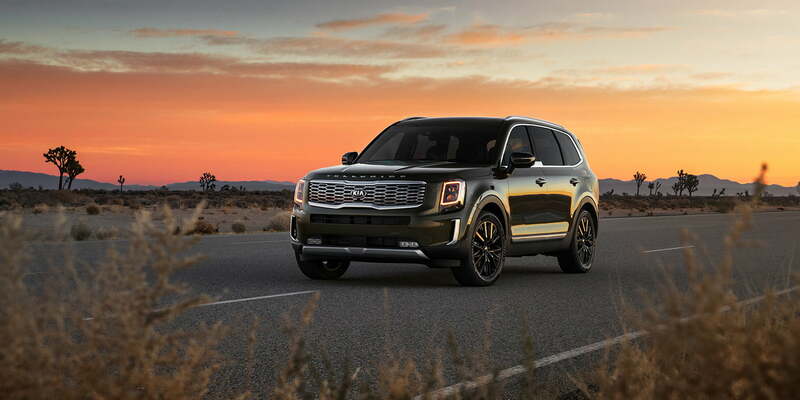 Kia has a winner on its hands with the 2020 Telluride thanks to a robust standard equipment suite, lots of connectivity features, plus passenger and cargo volume that embarrass some of the segment stalwarts. Its off-road chops may not quite live up to its boxy, vaguely rugged styling, but it has more than enough go-anywhere, do-anything capability for just about any modern family.